Hypothesis: Over 99% of prehistoric animal species are now extinct, many of which were no doubt delicious. By mastering advanced cloning techniques we can incorporate these long dead animal species into a unique and scrumptious BBQ experience. 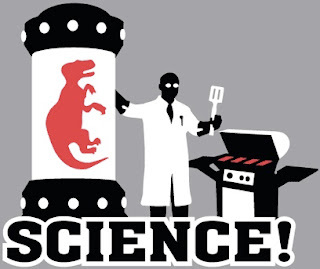 Result: The T-Rex proved delectable, but our 'Kiss the Cloner' apron failed to deliver. For other cool bioscience-related t-shirts, check out alternative fuel, germ wrangler, babe factory, and from his Amorphia Apparel line, life tee, ear mouse and flies. And if you buy two tees before June 30, you can get a 25% discount. Sweet. *I wish there was a female scientist on at least one of them though.